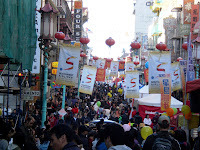 Since our Chinatown in San Francisco is so large, and the Asian population in general is pretty big, it makes sense that the country's second-largest Chinese New Year Parade is in San Francisco. I've been looking forward to it for weeks, and it couldn't have really been a better time. We took the Caltrain and the BART into San Francisco (I think I'll do a post on the public transit system soon) this afternoon, and headed from the Powell Street Station to Chinatown. For those familiar with that area of SF, the street fair covers California up to Broadway and Stockton to Grant. We walked several streets of the festivities, but there were a few others that we missed, in the interest of heading over to the parade route and finding a decent spot to stand ( more on that later). 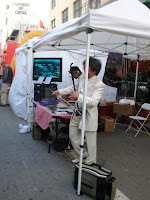 There was an erhu player that was absolutely fabulous. I got a few pics, but I really should have taken a video to be able to encompass the beauty of the sound. Oh well, hindsight is 20/20. There were a few spin-to-win roulette games, but the lin es were incredibly long. Of course, a few balloon vendors were handing out colorful balloons to the kids, there was a petting zoo, there was an inflatable playground, and they had a balloon sculptor making neat shapes. There were also a bunch of wok sales, and we came close to picking up another one (ours is sitting in FL). There were some neat gift items, including jade carvings, wood carving s, wall hangings, and Chinese pinwheels. We looked at two Chinese bakeries, but the lines were too long for us, so we moved along. 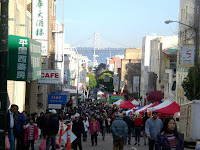 I was mentioning that I was upset we didn't enter through the "main gate" of Chinatown, and we decided to head out toward the parade route. Well, lo and behold, we end up walking OUT through the gate, so I was able to snap a few pics. We headed down toward Union Square Park, figuring that would be an excellent place to watch the parade since it goes completely around it. But, the place is closed off tightly (and it wasn't when we came into town, so they must have cleared it out just a short while before), with policemen not letting anyone through. So we found a decent spot to stand. We were across from the bleachers, so we knew it must be a good spot (the bleachers are sold $30/seat). We were about 3 people in from the street, and it was only about 4pm (the parade did not begin until 5:30). Jonathan suggested that he try and get a reservation at one of the restaurants that are on the nearby roofs. He headed off to see what he could find out and I held our spots. Turns out that the wait for a patio seat at the Cheesecake Factory on the top of Macy*s was about an hour, which would seat us when the parade began. So, we took it and proceeded to wander Macy*s for about 45 minutes. This is a BIG Macy*s, with seven stories of departments, and this was only for women... the Men's side was across the street! I checked out the coats, swimsuits, and shoes. We were sat at exactly 5:30, and our waiter (Joe) was kind enough to switch us from a center patio table to an edge table, so there was just a wall of glass between us and the world below. The parade was wonderful. I had never watched a parade from an overhead view, it was quite stunning. We couldn't hear everything the marching bands (there were like eight different ones!) were playing, and we couldn't see the parade when it passed by the bleachers (since that was directly below us), but it was spectacular. We also had the opportunity to dine e xquisitely at a restaurant that we don't normally go to, as it's quite pricey in Florida. 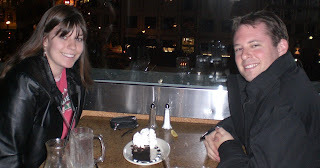 For some reason, the prices here were on-par with those of a Chili's, although we did have to splurge the $7 to share a slice of the Chocolate Tuxedo Cream Cheesecake. It was phenomenal: fudge cake, chocolate cheesecake, vanilla mascarpone mousse, and chocolate, with whipped cream and surrounded by chocolate and vanilla syrup piping. Besides the bands, there were a bunch of float, sponsored mainly by banks and other corporations, including South western Airlines. Nothing too extravagant, but lots of gold and lots of oxen. No balloons, which are always my big draw. The dancers were neat, especially those with ribbons, umbrellas, and flags. There were also a lot of fireworks, which were sparkly on the ground and gave off a lot of smoke. 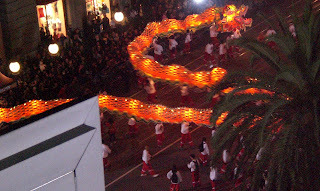 There were several dragons throughout the parade, made from different materials and different colors, including one that was over two hundred feet long. The lit-up one was my favorite. In case anyone was curious about the rest of the meal, we had the Firecracker Salmon Rolls, which were spicy salmon rolled in spinach and dried in a wonton wrapper, served with a sweet chili sauce and cabbage (delicious sauce, the salmon was kinda overpriced otherwise). I had the Hot Turkey Supreme, which was humungous (I don't think I even ate half before having it boxed up). It was an open-faced sandwich served with fresh fries... it was brioche bread, turkey, spinach, tomato, and bacon, all covered in a white cheddar sauce. I loved it, and thought the cheddar cheese sauce was delicious. Jonathan had the Grilled Skirt Steak with mashed potatoes, corn, and onion strings. He quite enjoyed the steak (it was in a mushroom sauce, so I wasn't a big fan), and we both thought the mashed potatoes were amazing. The onion strings, notsomuch.